Wow, what a week! Happy Birthday to us! What a proud Derwen College we are! Our 90th birthday has given a real opportunity to look back at our history and to involve our partners throughout our celebrations. And what a pleasure to work alongside our enthused students, trainees and staff as they delve into and explore our history, bringing it to life in the curriculum today. Here at Derwen College we have always gratefully benefited from the generosity of supporters. This ‘giving’ approach has meant that we have been able to protect and grow the quality of our provision. Donations are documented in our archives right back to 1927 and next year we will be celebrating 55 years registered with the Charity Commission. Just last week we won a local community and business award in the category of Charity of the Year. Being confident in our community helps us to remain strong. Whilst Government policy brings change and technology and terminology move on we stay close as a driver, an influencer, an organisation with credibility and expertise – we are a cog in the wheel of change; driving initiatives, lobbying, advising and collaborating. We believe that we hold an important place on the current UK political and social map and we have the ability to adapt and strive in times of inevitable change. So here we are in our 90th birthday year still inspired and re-energised! What will we look like when we get to 100 years old? For sure Dame Agnes’ fundamental ideals will remain unchanged and we will have another 10 years of expertise under our belts, but will all young adults really have the opportunity to choose and follow their dreams. We will be playing out our role, the one that Dame Agnes set out for us! What will you be doing? Let’s look even further beyond… we will be filling our time capsule in this milestone year – something to leave for future generations to open and discover. What will they say about our work? Had we done enough to move the world towards inclusive? Thank you Dame Agnes Hunt, you left us with an amazing legacy and a worthy challenge! A trio of local businessmen raised over £600 towards Derwen College’s 2017 fundraising target when they participated in the Oswestry Half Marathon recently. Managing directors Dean Jones and Joshua Weaver and Marketing Executive, Adam Thomas from a local printing company in Welshpool; We Are Promotional Products, took the plunge and decided to run the Oswestry Half Marathon in aid of Derwen College. We Are Promotional Products kindly donated printed T-Shirts for all those running for the college. “We are hugely grateful for the amount they have raised – £610 and we would like to say a MASSIVE thank you. This fundraising will go towards our £50,000 target this year needed to make repairs to the college swimming pool” said Jade Turner, Charity Marketing Officer at Derwen College. “The support from the community and businesses such as this is so important to us a charity and anybody interested in getting involved with fundraising can find out more at www.supportderwen.org.uk” Jade continued. As Derwen College celebrates its 90th birthday this year their fundraising target of £50,000 is needed to ensure the swimming pool on site remains in service. This highly valuable and popular resource has served the students well for over 40 years and is used for sport, recreation, canoe training for Duke of Edinburgh’s Award as well as therapies. “The training was hard work and we are still in pain, but it was well worth it in the end! 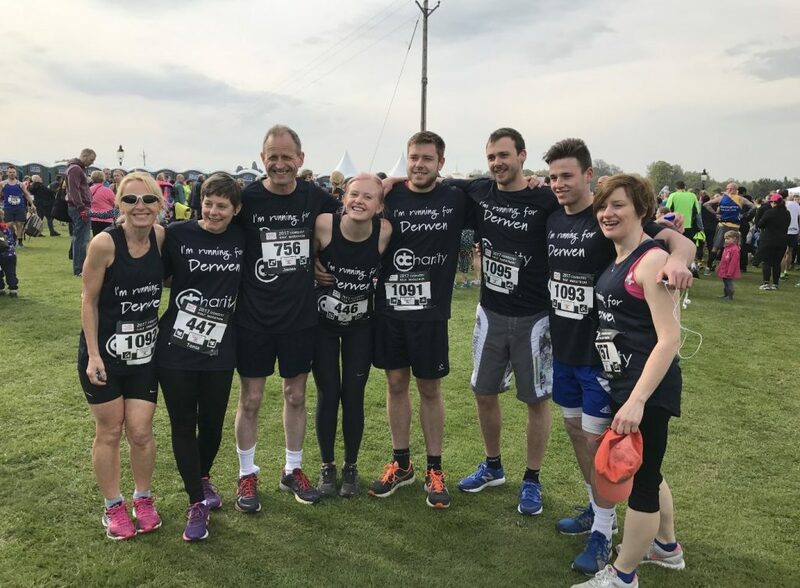 We had a great day at the Half Marathon and felt proud to be raising money for Derwen College” – said Dean Jones, We Are Promotional Products. 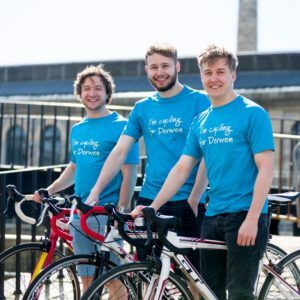 Two brothers and their best friend are planning to cycle from London to Paris to raise money for Derwen College swimming pool renovations. Elliot and Max Pettifer, along with their life-long friend Matthew Weston, have nicknamed themselves the Reliant Robins and are currently in training for the gruelling 300-mile, 4 day sponsored cycle ride in September. The lads, who are all in their twenties, pledged their help after hearing Derwen College have a fundraising target of £50,000 needed to make urgent repairs to their swimming pool. 250 young people with learning difficulties and disabilities who study at Derwen use the pool for vital hydrotherapy and physiotherapy sessions. 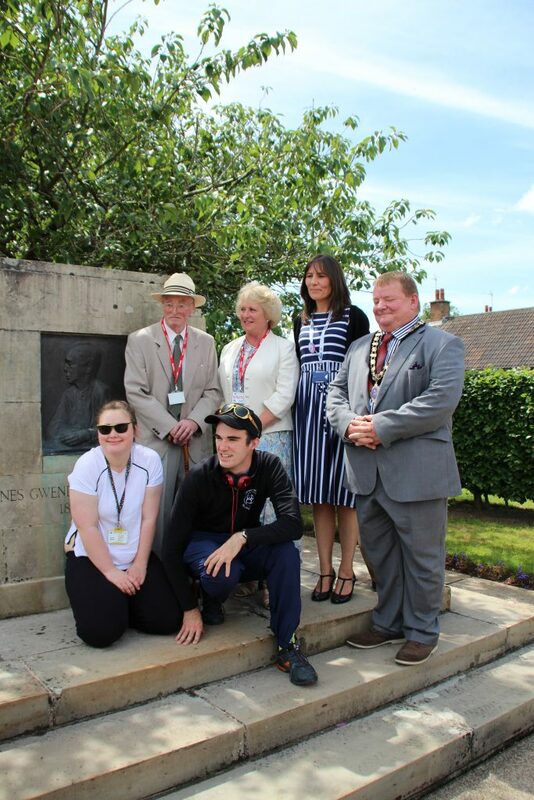 Max Pettifer said: “I was blown away by the enthusiasm of the students, teachers and supporters. They really are the nicest bunch of people with the kindest hearts. The Reliant Robins are hoping to raise more than £10,000 for the college and have launched a Crowd Funding page to help boost sponsorship from the public, friends and family. Matthew Weston, who admitted the trio had rarely cycled further than the local shops, said: “Derwen College receives very limited government funding and relies heavily on fundraisers and donations. “When we saw the great work being carried out at the college we knew we had to help. The students enjoy using the pool for sport, recreation and training sessions for Duke of Edinburgh’s Award. “Swimming helps to build their strength and their confidence and we could all see how much it means to them. Louise Keevil, Director Charity and Corporate Services at Derwen College said: “We are delighted that Max, Elliot and Mathew have chosen us as their charity for their bike ride from London to Paris. Times have never been as tough as they are now and without the kindness of others we would never be able to afford to get our pool back. Click here for a video of the Reliant Robins talking about the ride. Click here for a video of Derwen College commenting on the fundraiser.